"GMA, stormwater rules work against each other"
"A new challenger to AIA documents"
"No strings attached to federal stimulus bill?" 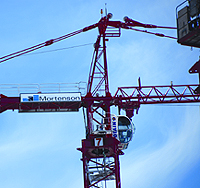 "How an insurance agent can help you find work"
As the construction industry awaits new crane safety standards, those coming rules must offer consistent and comprehensive guidelines to halt the jump in crane-related deaths and injuries. The Associated Builders and Contractors of Western Washington handed out 15 awards Wednesday at its 2009 Excellence in Construction Awards banquet in SeaTac. 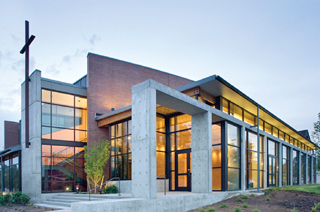 The Eagle of Excellence, the top award, went to Kirtley-Cole Associates for a new sanctuary at Bethany Community Church in Seattle. (Photo by Lara Swimmer Photography)Click here to read more.